How can Alpha Sigma Alpha help your council? If there is a Girls on the Run Council in close proximity to an Alpha Sigma Alpha chapter (on a college campus or in a city), you can expect involvement from members! Alpha Sigma Alpha is in regular contact with members to educate about GOTR, make connections with local councils and encourage volunteer participation. Some sites may even include the ΑΣΑ mascot – “Dot” the ladybug! 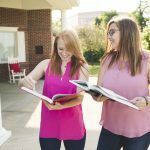 Check out the chapter locator to see which collegiate and/or alumnae chapters may be close to you. Contact information is listed for each chapter. We encourage you to reach out to chapters directly. If you would like assistance in contacting a chapter, Kim Richard.